While I am a serious defender of the screw cap and the benefits of knowing that the wine you're purchasing isn't going to be corked, I do have to defend the cork and all the romance it offers. For at least a century vintner's have used the sponge-like tree bark to enclose wine bottles and although it may offer a less than perfect method of enclosure, it does allow for slow micro-oxynization. Now, weather that process of slowly oxidizing a wine over a period of years is limited to the cork remains to be proven, but I have the belief that because the cork does allow minute amounts of oxygen to enter into the bottle, perhaps this is just what the wine needs to transform into that time honored "aged wine taste". Time will be the determining factor as to how screw cap wines age over the decades and if they stay fresher and more lively after extended aging. Now, I must play devil's advocate here and say that I am almost always horribly offended when a "wine consumer" walks into the cellar and acts like the wines with screw caps are no good and laughs off the possibility of buying a wine with such a ridiculous "soda bottle cap". I admit that I sometimes won't let them leave until they are in agreeance that the Stelvin tops are the best and most sanitary method of preserving a wines beauty over time. I guess that I'm not really fighting for the screw cap but more against the arrogance of the cork-lover. Arrogance and wine-snobbery just has no place with this beverage anymore and I just can't stand the snooty traditionalist attitude towards a bottle grape juice. So, I guess what I'm really saying is that I have no preference in how a wine is enclosed. Corks, screw caps, glass, synthetic, or whatever you like, it's just a matter of aesthetics and traditions. Great points, I too agree that screw caps are probably more beneficial for white in order to preserve freshness. Interesting to know that industry pro's are searching for methods to help the wine age with stelvins. I'm not necessarily a cork snob as I do have a rather extensive collection of screw cap bottles, artificial cork bottles, and real cork bottles. I do find that the ceremony of uncorking a bottle to be part of the wine-drinking ritual. The artificial cork seems to offer the best of both worlds--no corked bottles and preserving the ceremony. Yes, it is fun to pop the cork! Makes for a neat experience even though it has nothing to do with the matter of the best way to preserve a wine over time. I like what the Germans are doing with their Vino-lock made by Alkai Glass (sp?) Very elegant looking, like a perfume bottle. Emrich Schoneleber and Peter Reinart and Munzberg are using them. They are some of the most respected growers out there. I love the glass closure too! It's a bit more elegant than the screw if you ask me. I encountered my first glass enclosure today. As part of a wine course that I am doing, I learned that a number of German producers are using them, but it's been a few months since I read that and haven't seen one yet. However, this was on a South African wine ("Chamonix Blanc") that I opened this evening and it was very unexpected. 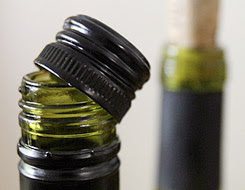 As to the cork vs screwtop debate, I used to be a cork snob but that was before I knew as much as I now do about wine and I probably hung onto the "traditional" aspect of it due to insecurity. And that was also years ago before as many quality producers used them, especially in white wines from Australia, New Zealand and South Africa. PS Have just discovered your blog after your comment on mine, will definitely be reading it more!